As some of you know from my first road trip, I have a car in my possession affectionately dubbed 'Grampa's Hoopty.' I acquired this piece of precious Oldsmobile when I flew from London to the States last October, landing first in Oklahoma then taking the scenic route to San Francisco. Now it is time for Grampa's Hoopty to go home. But first...Hoopty wants to see the Pacific Northwest. That's just how he rolls. And our first stop? Portland, Oregon! This was the view on the drive up: there was the 'town' of Pollard Flats (gas station? check! diner? check! rattlesnake in a cage? check! all under one roof? check! township, DONE.) 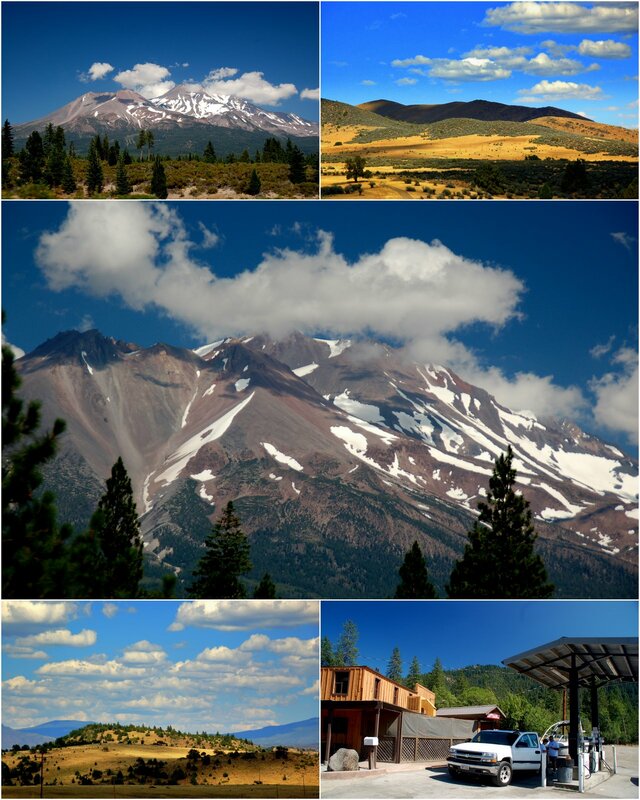 and then Mount Shasta, which popped up out of nowhere and danced a crazy fool dance. My road trip companions and I arrived in Portland after our twelve hour mega-drive on Monday night and now we're currently rocking the hip hip hipster Ace Hotel, OD'ing on Stumptown Coffee, and stalking Powell's Books. Basically, living the dream life. Pictures coming soon! p.s. I'm debating about double-posting these road trip stories and pictures over on Moonpies so as to give it a sense of round-trip completion. Do you think I should, or is it not worth the bother? Or do you have a better idea? Rona...just got back (Aug 11th) from my trip to Moab, Arches & Canyonland Parks in Utah. Gorgeous!! I'm going back, someday. Now I've been meaning to say and ask you - I just meet you two months ago, via SF movie scenes search, so I'm new to all this London and S.F. life of yours. Are you coming back to SF ??? If you say no and break my heart, it's ok I'll keep writing. Fantastic pics as always! Whatever blog you decide on, I'll follow. Just let me know! I think it'd be cool to put these on Moonpies. Then again, I think it'd be cool to have a blog with a scope big enough for you to maintain for a year or so. It'd be nice to see a through line over a couple years. I currently have 4 of your blogs in my reader. I look at my blog and see a big change between its inception and today, but maybe I'm seeing more than is actually there. Either way, it's a nice catalogue of growth, pain, change, life, etc. I also think it needs to be continued on Moonpies, just to complete the circle. Awesome photos as always, can't wait to see more! Did you happen to drive near the redwoods? Any pics of these? I don't know why but I have always been fascinated by the giants. Jim, alas! I am London-bound indefinitely! Kyle--I think you are right--I think Today is going to be my permanent blog from here on out! I've retired Invisible Gifts and London Footnotes (from a google perspective, anyway), but this one I think I'll keep. And there's something really grounding about knowing I've got something to keep. Mom--I'll do it! I'll copy all my posts over there and then retire it when I land in London! yesssssssssss! Oh how I wish I could have joined you for this leg of the road trip! I love Portland. I guess I will have to visit you in London!